Why choose Hawksmoor Animal Hydrotherapy? Hawksmoor Hydrotherapy was established in 2000 and was one of the first small animal hydrotherapy centres within the UK. Our Animal Hydrotherapists use hydrotherapy techniques to dogs and small animals with any rehabilitation needs or help recover from injury, part of pain management or even as exercise for animals with mobility issues. The Hawksmoor Animal Hydrotherapy Courses are all run by an experienced team of highly qualified professionals. Having all achieved the Level 3 Certificate in Hydrotherapy for Small Animals and the Level 3 Diploma in Hydrotherapy for Small Animals. 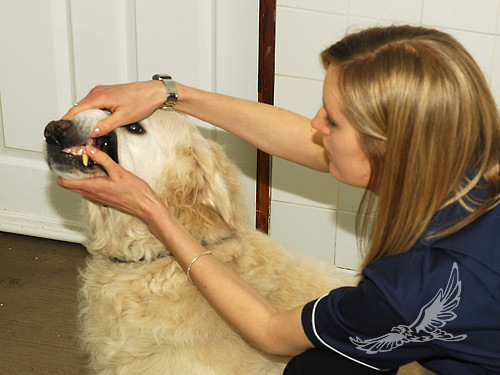 Our Animal hydrotherapists are also Veterinary Nurses and Veterinary Physiotherapists. What to expect from your hydrotherapy sessions? At Hawksmoor we pride ourselves on delivering the gold standard in animal hydrotherapy treatments. There are a lot of hydrotherapy centres throughout the UK and it is important you ensure the centre that you choose for your dog to undertake hydrotherapy offers a professional and safe standard of practice, bearing in mind your dog may have undergone complex surgery prior to receiving canine hydrotherapy treatment. If the hydrotherapy centres techniques and practice are unsafe you may potentially be exposing your pet to complications in their condition or risking re-injury. At Hawksmoor animal hydrotherapy we will only swim one dog at any one time. There are many hydrotherapy centres at the moment who perform multiple dog swimming. Hawksmoor have grave concerns in regards to this as we see many dogs post operatively e.g. post cruciate surgery or spinal surgery and if there is more than one dog in the hydrotherapy pool or treadmill area, even if they are from the same family, there is an increased potential for the dog being treated to become anxious or frightened. When your pet becomes anxious and in particularly frightened, like us, the body produces the response of fight, flight or fright. This in turn causes adrenaline release in to the body and therefore blocking your pets critical pain pathways. This may potentially be of detriment to the patients condition and therefore the patient has undergone unnecessary stress and an unproductive hydrotherapy session. On your pets first session we will conduct an assessment. We will measure your pets muscle mass to determine their distribution of weight but also if there is any increase or wastage in certain muscle groups. We will also analyse their gait, to assess how they are moving, to see if they are standing, walking or trotting evenly or whether their is any preference in weight bearing, length of their stride or preference of pace and the pattern to their gait. This will then be repeated at session 5 and/or session 10 dependant upon their condition and an in depth feedback report sent to your vet. On the first and every subsequent session we will perform a full heath check on your dog. They will also receive a shower pre and post session and an appropriate buoyancy jacket or harness will be fitted. Post session we will ensure they are as dry as possible before leaving the centre however in the colder months if you have a coat for your dog please bring this with you. Every patient is accompanied into the hydrotherapy pool or aquatic treadmill by one of our hydrotherapists. We encourage you to be actively involved in your pets hydrotherapy session from the side of the pool and aquatic treadmill in order for your pet to be reassured and gain confidence in the water. If your pet has a favourite treat or particular toy they like to play with please bring those along to the session. We will not allow your pet to retrieve toys off the surface of the pool (the waterline) due to the risk of inhalation of water however we are more than happy for them to follow one around the pool to encourage them during the session. We do then have a controlled play with the toy on either rests or when the session is finished. Hawksmoor are members of the Canine Hydrotherapy Association (CHA) so are able to process insurance claims. We’re always happy to help, speak to one of our experts today.